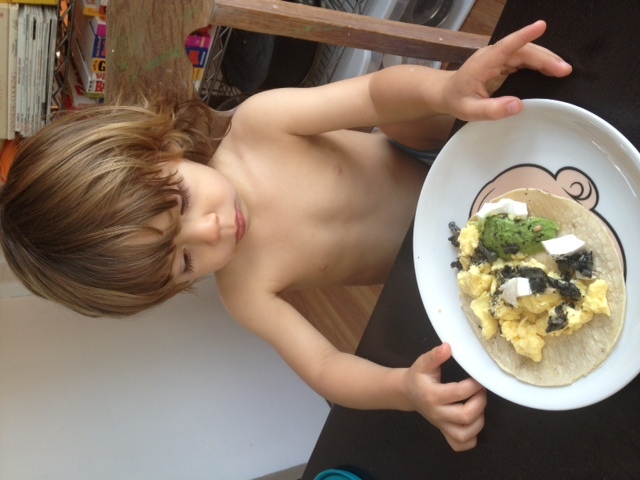 In any event, I have combined some photos that overflow with their cuteness (in my personal, non-biased opinion) with a few pointers on how to best use any leftovers from giant Mexican feasts you may throw. 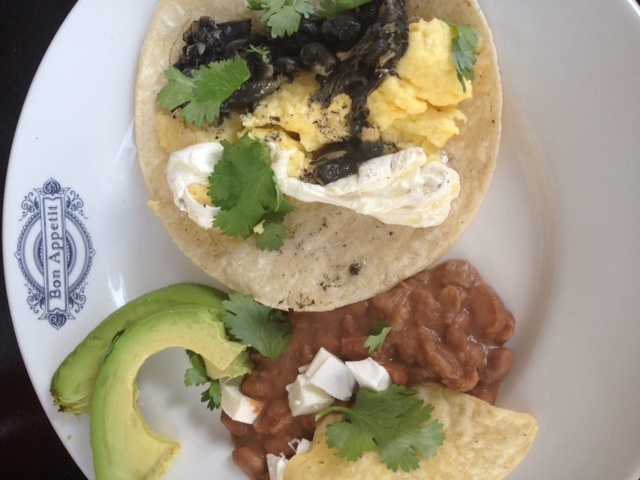 Before I get to the boys, let me just say that I firmly believe that Mexican food makes for the BEST ‘leftovers turned breakfast.’ The only thing I really added was scrambled eggs and suddenly it went from cena to desayuno. Magic! 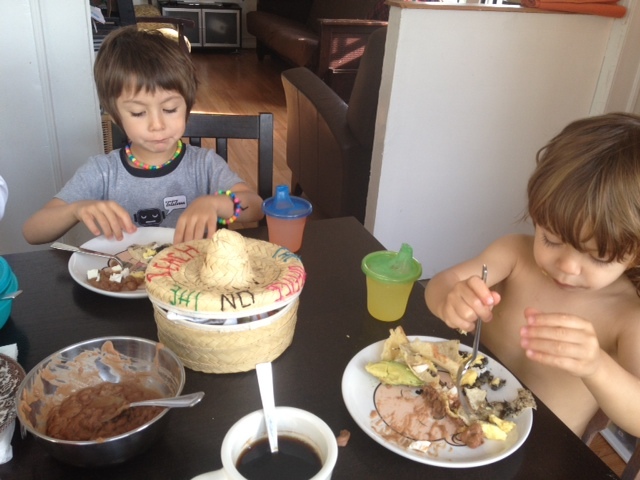 Carlitos has a weird doubtful look on his face but I assure you he devoured that whole plate. Oh, I forgot to mention that coffee and juice help turn this meal magically into breakfast the next day. Throw some cinnamon in that coffee and you are practically eligible for a Mexican passport. 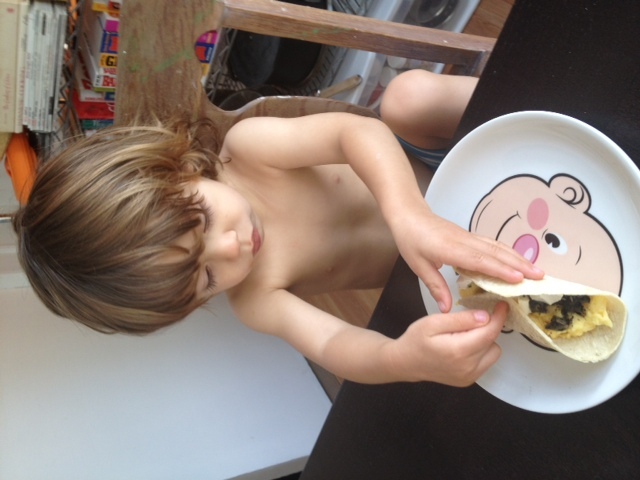 And now, Xavi will show you how to correctly eat a taco. Because dude, if a 2-year-old can do it, you can too! 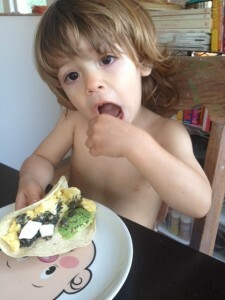 For this tutorial, he chose an egg, queso fresco, huitlacoche, avocado combo. And then eat the insides with your hands? I was certain you were supposed to leave it rolled up and take a bite of the whole thing. 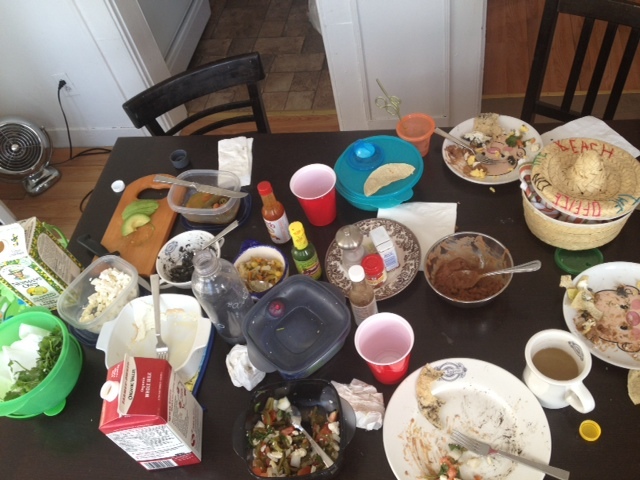 I guess Xavi is trying to teach us that there are no rules when it comes to tacos, or Mexican food, or, well, food in general. Just enjoy it. 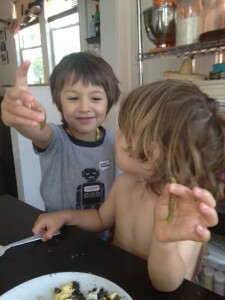 Showing me their favorite part of the cactus salad: The cactus. Who’d a thunk it. 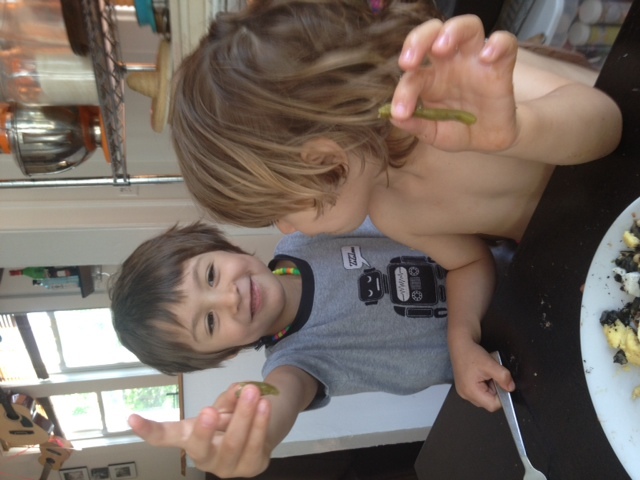 Sometimes, when getting your kid to eat their veggies, the more worm-shaped, the better. The only downside of turning your giant dinner into a giant breakfast? Doing TWO huge clean-ups in less than 12 hours. On days like this, Tupperware instead of serving plates and a few Solo cups instead of ceramic ones kind of save me, even if it isn’t so elegant. Another tip? The more that gets eaten…the less you have to put away again afterward. Luckily, getting your family to gorge themselves on a breakfast this yummy shouldn’t be too tricky. 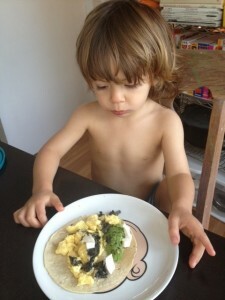 This entry was posted in Mommy: just showing some baby love and tagged cactus, cute kids, Mexican breakfast, tacos, Tupperware, what to do with leftovers. Bookmark the permalink. Follow any comments here with the RSS feed for this post. Post a comment or leave a trackback: Trackback URL. 6 Responses to Turn Dinner into Breakfast? Done. Magician Status! Your kids eat very well. Mine (especially C) are more of the “don’t let the different types of foods touch each other on the plate” kind of eaters. Even a bell pepper is slightly exotic to them, sadly. The really do eat really well! Both of my kids would cry and scream “No! !” if I presented them with that delicious breakfast. 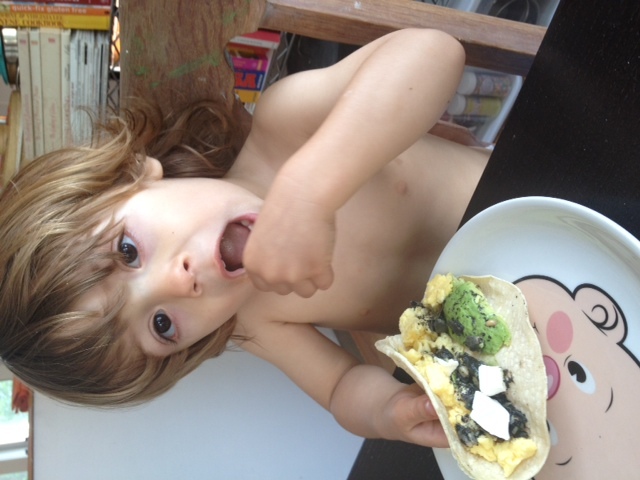 Zoe – Excellent point regarding the tortillas! Even at authentic Mexican restaurants here I never find tortillas that taste quite as amazing as in Mexico. I’ve also never had pizza quite as perfectly delicious here as in Rome, so part of it is just how it goes. For our Mexican feast the other night, Paola brought tortillas from Mexico 2000 (linked to in the post), which I just noticed were actually made at Tortilleria Chinantla (linked to above). They were good. Better than what you can find at Fairway, but nothing like what you can find south of the border. For full, FULL disclosure, we also used these tortillas I found on FreshDirect that actually taste the closest to the thick, homemade-by-little-old-ladies variety found often in breakfast tacos and ‘quesadillas’ eaten in Mexico. (Quotations used to accentuate difference between quesadillas in Mexico and here: two different breeds. I’ll let you guess which one is yummier.) My husband and Paola agreed that they were the closest they had tasted to the plump Mexican type, BUT these are made with a corn wheat combo. Strange. Okay, so you tricked me into writing a secondary full-length post in the comment section! Carly – Well, part of it is probably that my kids are half Latin and have therefore been fed foods that some would consider ‘exotic’ since birth. 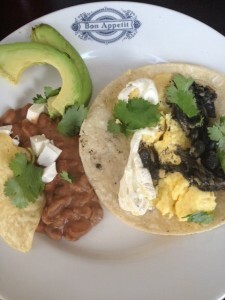 They have a grandmother from Panama, a grandfather from Mexico, a great-grandmother from Mexico and even a mom that loves to learn all family recipes (including from her husband’s side of the family) so they were eating queso fresco and avocado long before peanut butter. 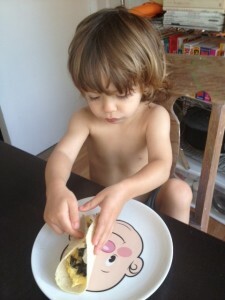 I have seen these kids grow up and I think it’s great that you make them at least try everything…even if it is a little “pica” or spicy : ) I remember I was introduced to a wide variety of foods as a kid and it’s made things a lot easier. I am not a picky eater so as an adult it’s very easy to go out to different resteraunts or eat with fiends that have different tastes because I’m willing to try a variety of foods. I think it’s great to diversify your kids’ diet. Cute pictures too! Thanks, Emily! We have recently had to come up with an arbitrary rule: You are not allowed to ‘not eat’ more than 3 items; if you try to do so, you will be sent back to Start and will have to eat ALL foods. Variety is the spice of life, my dear! I agree! It ain’t a cliche for nothin.